Tipard DVD to MP4 Suite for Mac is bundled with two MP4 Converter software – the Mac DVD to MP4 Converter and MP4 Converter for Mac. This DVD to MP4 Suite is a great software to convert DVD to MP4 on Mac or change DVD to MP4 format compatible with iPod, iPhone, PSP, PS3, Zune, Sony Walkman, Sandisk Sansa, Archos, iRiver PMP, and Apple TV, etc. Besides, Tipard DVD to MP4 Suite for Mac has the utility to convert almost video formats (also HD video) to MP4 format. 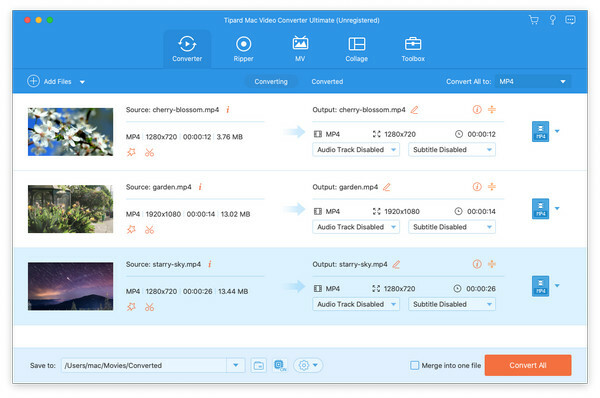 Convert DVD to MP4 on Mac or change DVD to MP4 format compatible with iPod, iPhone, PSP, PS3, Zune, Sony Walkman, Sandisk Sansa, Archos, iRiver PMP, and Apple TV, etc. Tipard DVD to MP4 Suite for Mac can adjust your video effect to the prime performance by using the poweful brightness, contrast and saturation. Tipard DVD to MP4 Suite for Mac can convert your video to a widely range formats needing only one time conversion. Tipard DVD to MP4 Suite for Mac helps you to convert interlaced video to the progressive video, this function can optimize the video effect and allow you to preview. Tipard DVD to MP4 Suite for Mac allows you to choose the audio track and title language, which can make you feel more natural. The article provides different ways to play DVD on Wii, and you can always find the best way accordingly.